Sure, sure... we review a lot of Nerf blasters and toys. 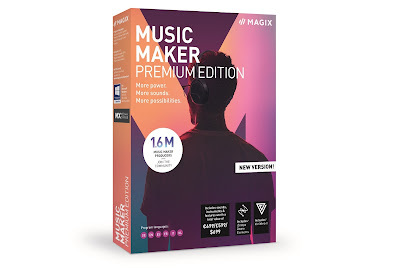 With each new product there is usually something unique and interesting to say about it, from the super-quick firing Hyperfire, to the car-shooting Nitro range. However, one thing we've never blurted out is 'this is the best Nerf blaster we've ever tested'... until today. 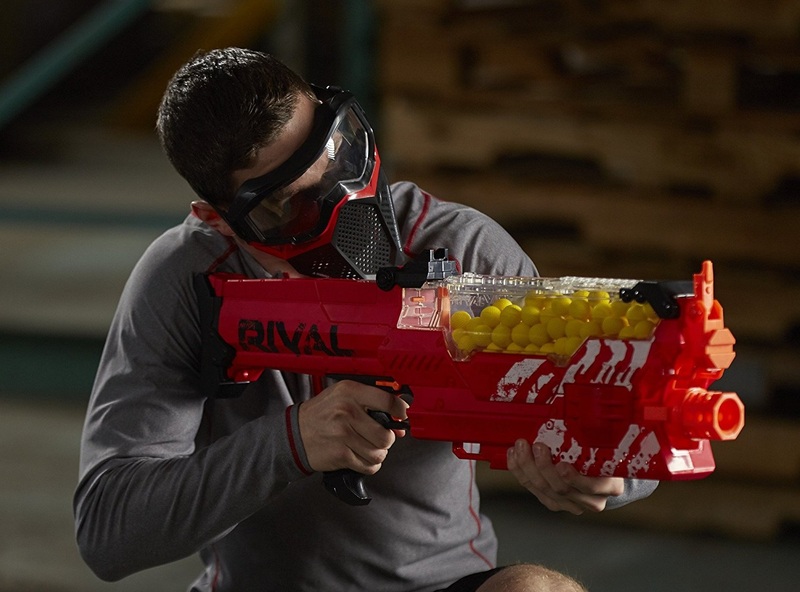 Because the Nerf Rival Nemesis is THE BEST NERF BLASTER WE'VE EVER TESTED. Read on, kids. 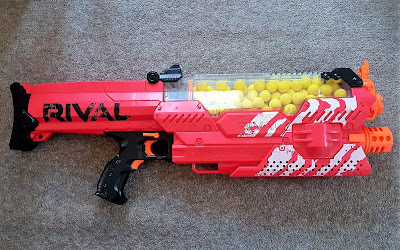 First up, this is also the first ever Rival blaster from Nerf that we've reviewed. 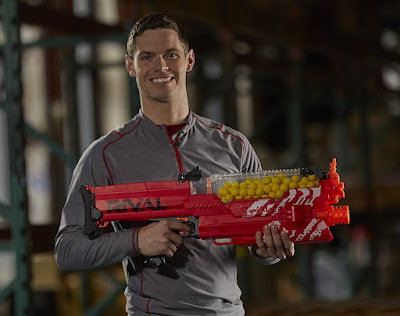 For those not in the Nerf-know, the Rival line of shooters has been designed for teenagers and adults, with the guns shooting small golf ball-like foam balls instead of the traditional darts. Because of this the Rival blasters are more accurate and can, so Hasbro claim, shoot further and faster. 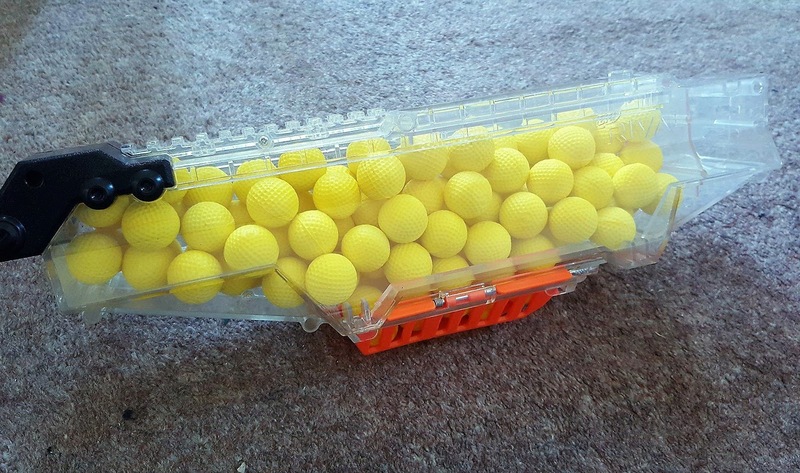 The Nemesis is no exception to that, but noteworthy for having the largest capacity of any Rival blaster (so far) with a hopper capable of storing 100 balls. These balls are gravity-fed onto a conveyor belt which pulls them into the two flywheels. Then POP, they shoot out of the barrel at up to 100 feet per second. 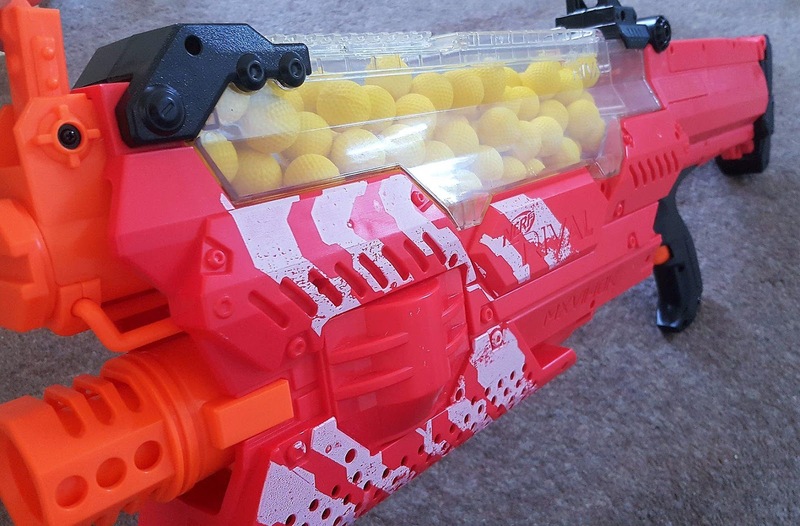 The Nerf Rival Nemesis does this at a rate of around three to four balls per second, meaning it won't be too long before you burn through all those 100. However, all this comes at a cost, as the Nemesis is large (almost 75cm) and weighty (2.2kg!). Even younger teenagers may struggle to wield it in battle, especially if there is a lot of running around involved. Even larger adults will tire of holding it after a while. Trust us. But, the payoff is in the use. It is comfortable hold for long periods (excluding the weight) thanks to the simple design. 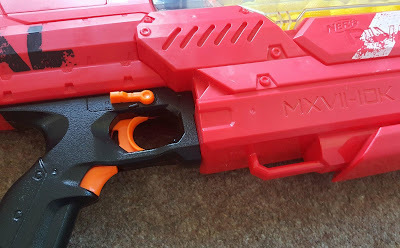 The batteries go into the stock which perfectly balances it to your trigger hand, and there are no weird shapes or clever aesthetic-only design features: you hold it like a rifle and go. By the way, this thing takes six D batteries, which obviously aren't included. There is, however, the option to purchase Nerf's rechargeable battery pack that fits this blaster. We've heard it is slightly lighter than six Ds, and also provides a pinch more power. Worth considering. 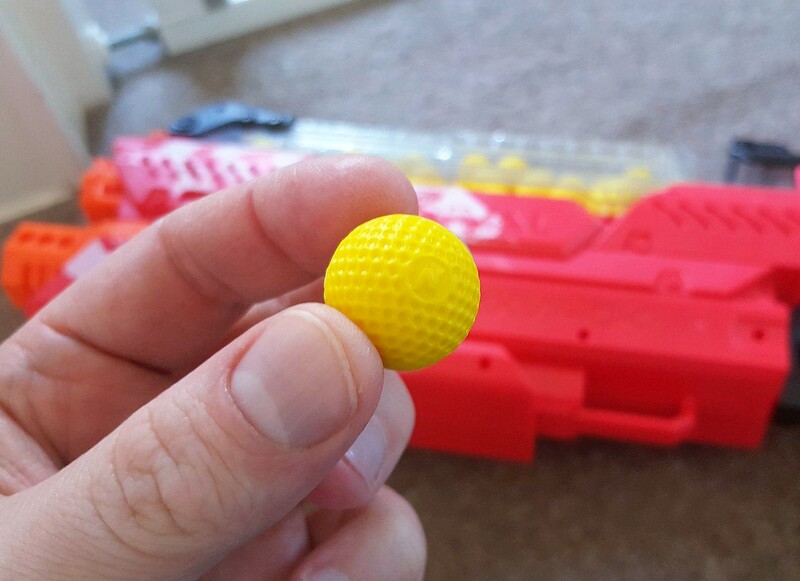 Although that 100-round hopper can be detached from the main body of the blaster, you'll only do so to fix a jam. 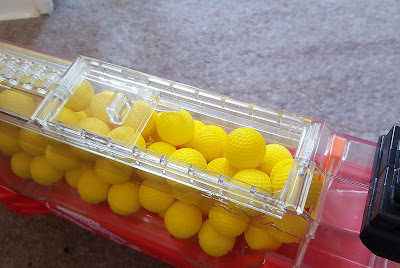 That is because all the ammo can be loaded in via a sliding top hatch, meaning all you need to keep this stocked up is a sack of spare Rival balls while you battle. When you're low on ammo, just drop a few handfuls in, so you don't have to lug around bulky plastic magazines. Reloading is also refreshing quick because of this - far quicker than you'd expect a 100 round blaster to be. Operating the Nerf Rival Nemesis is just the same as firing a conventional flywheel Nerf Elite blaster: squeeze the flywheel trigger to get the motors spinning, then pull the trigger to shoot. You can hold down the trigger for full-auto, or just for a second or two to unload a full balls. 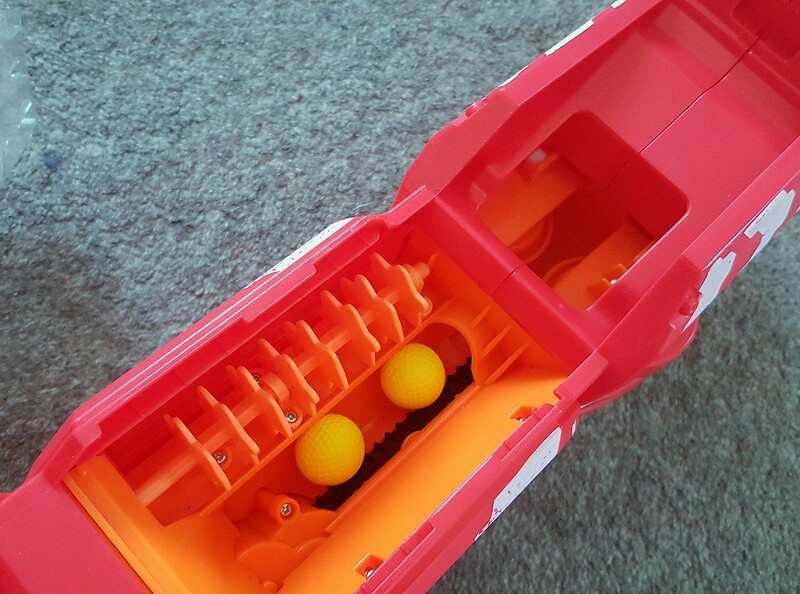 Importantly, with the flywheels spinning, when you pull the trigger the balls don't immediately shoot. We found there was often a good half to full second before the balls come, especially on the first firing. This is because it takes a short while for the balls to fall from the hopper, be carried by the conveyor belt, and get caught by the wheels. Not a massive issue, but worth remembering. Another unique feature of the design is the safety switch. Flick it up and the blaster won't shoot, having been locked in both the flywheel and firing triggers. It's a useful thing, especially if you're leaving your blaster around near younger kids (who will, trust us, gravitate toward it), but we found that it very easily disengaged accidentally. The switch itself is quite loose, and often unlocked when we grabbed the handle. Again, one thing to consider. But here's what you really need to know: The Nerf Rival Nemesis is the most accurate Nerf blaster we've ever shot, and the Rival ball system is hugely impressive. Shots over 70 feet where still travelling along a straight-ish line - a distance where the traditional darts would go off target. This means Nerf fights can be fought over greater distances, and due to the fact that the balls tend to bounce off walls and floors (often rebounding to hit the shooter!) you'll probably want to, anyway. So, we utterly love this thing. 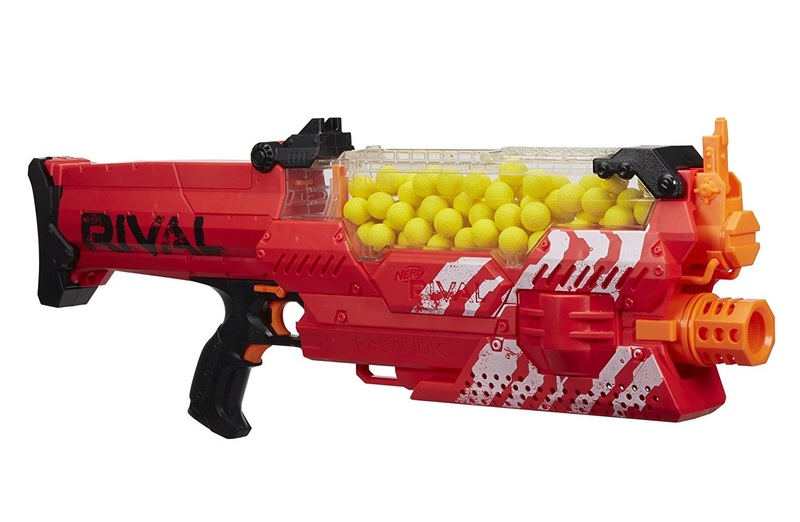 If you can handle the size and weight, the Nerf Rival Nemesis should be your go-to blaster for quick-firing, ultra-accurate home and office battles.